This antibody detects endogenous levels of human IRS-1 only when phosphorylated at serine 639. In rat and mouse the phosphorilation site in at serine 635. The antibody was affinity-purified from rabbit antiserum by affinity-chromatography using epitope-specific phosphopeptide. The antibody against non-phosphopeptide was removed by chromatography using a non-phosphopeptide corresponding to the phosphorylation site. Our Abpromise guarantee covers the use of ab47404 in the following tested applications. May mediate the control of various cellular processes by insulin. When phosphorylated by the insulin receptor binds specifically to various cellular proteins containing SH2 domains such as phosphatidylinositol 3-kinase p85 subunit or GRB2. Activates phosphatidylinositol 3-kinase when bound to the regulatory p85 subunit. Polymorphisms in IRS1 may be involved in the etiology of non-insulin-dependent diabetes mellitus (NIDDM) [MIM:125853]. Contains 1 IRS-type PTB domain. Serine phosphorylation of IRS1 is a mechanism for insulin resistance. Ser-312 phosphorylation inhibits insulin action through disruption of IRS1 interaction with the insulin receptor. 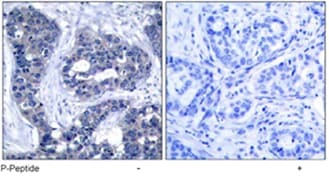 Phosphorylation of Tyr-896 is required for GRB2-binding. ab47404 has not yet been referenced specifically in any publications. Publishing research using ab47404? Please let us know so that we can cite the reference in this datasheet. There are currently no Customer reviews or Questions for ab47404.